CANADA - After leading the morning practice session for Sunday's SCCA Pro Racing SPEED World Challenge GT Championship Round Eight race, part of the Mobil 1 Presents Grand Prix of Mosport, Eric Curran, of East Hampton, Mass., bettered his time in the afternoon, edging Lawson Aschenbach, of W. Palm Beach, Fla., for quick time of the day at Mosport International Raceway. Coming off his third win of the season last month at Mid-Ohio, Curran wheeled the No. 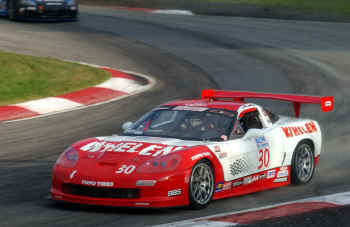 30 Whelen Engineering Chevrolet Corvette around the 2.459-mile (3.957-km) circuit in a time of 1:22.972 (106.691 mph). The time was just 0.003-second better than Aschenbach"s in the No. 1 XM/Mobil 1/Motorola/Bose Cadillac CTS-V.
Lou Gigliotti, of Dallas, Texas, was third fastest in the afternoon session and on the day with a lap of 1:23.087 (106.543 mph) in his No. 28 LG Pro Long Tube Headers Chevrolet Corvette. Andy Pilgrim, of Boca Raton, Fla., was fourth quick on the day in his No. 8 XM/Mobil 1/Motorola/Bose Cadillac CTS-V with a lap of 1:23.501 (106.015 mph) in the earlier session. Michael Galati was fifth on the day in his No. 23 K-PAX Racing/Jim Haughey Porsche 911 GT3 with a time of 1:23.512 (106.001 mph), also done in the early session. Ron Fellows (Cadillac CTS-V), point leader Randy Pobst (Porsche 911 GT3), Brian Kubinski (Chevrolet Corvette), Michael McCann (Dodge Viper) and James Sofronas (Porsche 911 GT3) completed the top 10 on the day. Qualifying for Saturday evening�s race is scheduled for 11:20 a.m. (EDT), with the standing start scheduled for 6:35 p.m. To follow qualifying and the race via live timing and scoring and notes via the SCCA Pit Board, visit www.world-challenge.com.